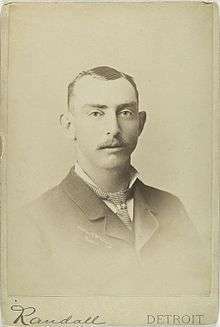 James Evans "Grasshopper Jim" Whitney (November 10, 1857 – May 21, 1891) was a professional baseball player. He was a right-handed pitcher over parts of ten seasons (1881–1890) with the Boston Red Caps/Beaneaters, Kansas City Cowboys, Washington Nationals, Indianapolis Hoosiers and Philadelphia Athletics (AA). He was the National League strikeout champion in 1883 with the Boston Beaneaters. For his career, he compiled a 191–204 record in 413 appearances, with a 2.97 ERA and 1571 strikeouts. During his five seasons with the Boston franchise (now the Atlanta Braves) he ranks 4th in franchise history in ERA (2.49), 3rd in WHIP (1.082), 9th in innings pitched (2263 2⁄3), 8th in strikeouts (1157), 9th in games started (254), 4th in complete games (242), 1st in strikeout to walk ratio (5.03), 7th in losses (121), and 2nd in wild pitches (162). He was born in Conklin, New York and later died in Binghamton, New York at the age of 33.